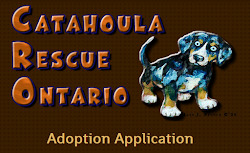 Catahoula Rescue-Ontario: Meet Tango ADOPTED! This cutie is approximately 5.5 months old and around 30 pounds. But he's still a growing boy and will be a medium-large sized dog. He is a Catahoula mix as best we can see. The camera doesn't do this handsome boy's freckles justice. Tango is a very happy and busy puppy. He is very social and loves meeting new people and dogs. This dude loves spending time outside and rolling around in the yard. He loves chasing toys but doesn't quite have the hang of bringing them back yet. 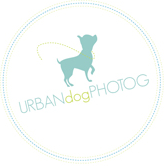 He is very good about his crate and is just about fully potty trained if you get him outside often enough. He needs plenty of daily exercise (age appropriate). He is good with other dogs, but will need continued socialization to new dogs over the next few months so he remain comfortable and learn more dog-dog language. Tango is a smart cookie and has learned to sit and also learned to lie down in a day. His foster is working on more basic training, but he (and his future owner) would greatly benefit from an obedience class. He is very food motivated and eager to learn. Tango received his third round of vaccinations on October 3rd and will be neutered shortly. He is also microchipped.